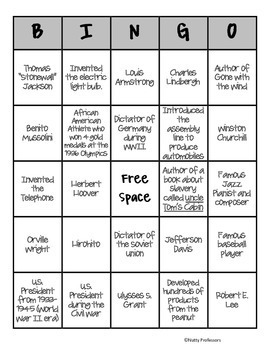 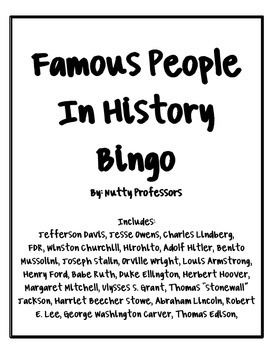 This product includes 12 bingo cards and clue cards that cover 23 influential people from the Civil War to WWII. 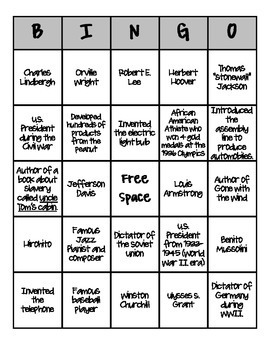 This game can be played whole class, with partners, in a center, and is easy enough for a student to monitor. 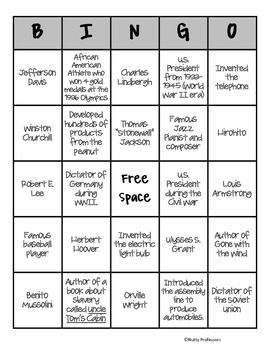 FDR, Winston Churchill, Hirohito, Adolf Hitler, Benito Mussolini, Joseph Stalin, Orville Wright, Louis Armstrong, Henry Ford, Babe Ruth, Duke Ellington, Herbert Hoover, Margaret Mitchell, Ulysses S. Grant, Thomas “Stonewall” Jackson, Harriet Beecher Stowe, Abraham Lincoln, Robert E. Lee, George Washington Carver, Thomas Edison.